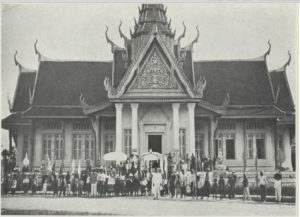 In 1931 Suzanne Karpelès, founding director of the Royal Library at Phnom-Penh and of the Institute of Buddhist Studies established educational film projections for the Buddhist monks at the Royal Library and in the outdoors for rural populations in Cambodia, Cochinchina and Laos. The project traces the emergence of Karpelès’ film initiative by looking at her interactions with Laura Dreyfus-Barney, a wealthy American living in Paris, who chaired the cinematography sub-committee of the International Council of Women (ICW), the ICW’s peace and disarmament committee and was a key figure in the peace and disarmament committee of women’s international organisations, as well as playing an important liaison role with the United Nations. Working on this project has raised questions about intersections of internationalism and empire. I am also exploring some of the project’s implications for how the entanglement of spatial scales is conceptualised in the analysis of empire and how this might relate to spatial and temporal imaginaries of internationalism.